Tiny observations from a small-town journalist. Although Broadway patrons are currently raising their medieval chalices in a toast to Monty Python's "Spamalot," those who have yet to visit the Sam S. Shubert Theater to see the unruly musical may be best advised to rent the musical's cinematic source material, "Monty Python and the Holy Grail." In a disappointing lack of ingenuity, the bulk of "Spamalot's" best jokes are directly lifted from "The Holy Grail." "In the know" audience members who have seen the film greeted familiar bits by rapturously applauding the appearance of "Holy Grail's" most beloved moments, such as the Knights Who Say Ni and the homicidal bunny rabbit. 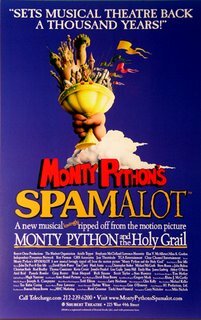 Hank Azaria, as the French Taunter (among other parts), took advantage of the room for improvement upon "Holy Grail" offered by "Spamalot." His depiction of the rowdy castle-dwelling annoyance launched the audience into a comedic coma. Furiously delivering his lines and spitting buckets while doing so, Azaria was a delight to behold. The lines themselves weren't even that audible. The "Black Knight" bit deeply suffered from the film-to-theater transition. Using crimson paper tassles instead of geysers of fake blood to signify the Knight's hacked limbs greatly spoiled the bit's humorous value. In "Holy Grail," the Black Knight's calm refusal to surrender his duel to King Arthur in the face of lost limbs was hilarious in contrast to the raging action of his rapid loss of blood. Without that key ingredient, the bit seemed undercooked. The feature additions to "Holy Grail" in "Spamalot," the musical numbers, were largely ho-hum. "Not Dead Yet" was an amusing expansion upon one of the film's best jokes, but the Lady in the Lake's self-referential numbers (such as "Once in every show there comes a song like this...") were fleeting goofs that couldn't last far enough to keep the songs fresh and fun. Of course any freshness or fun in "Spamalot" is limited if one has already seen "Holy Grail," and a cost analysis would certainly point to the better option.